I recently wanted to record the audio track of a streaming video in Ubuntu 15.10 but there was no application available to use by default. 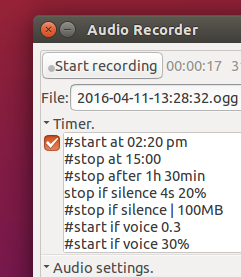 In the past Ubuntu used to come with a sound recorder by default, not anymore it seems. It wasn’t a big issue anyway because there are many sound recording applications out there for GNU/Linux nowadays. So I searched around a bit and found one that was simply called the ‘Audio Recorder’, which is a very minimalist looking unofficial GNOME application. I first installed the Audio Recorder included in the default main repository for Ubuntu 15.10. That is actually an outdated version and consequently has few drawbacks. First of all it didn’t show the audio levels of the incoming audio correctly (nothing major). But most importantly, it only supported recording into 4 audio formats (OGG: 160kb/s, 44khs, WAV: lossless, 22/44 khz, FLAC: lossless, 44khz, SPX: lossy 32khz), excluding MP3 support which was undesirable for my needs. So I searched a bit and found its official PPA and it includes a more up-to-date version that comes with support for 3 additional audio formats: MP3, MP2 and AAC. It also fixed (somewhat) the volume level indicator issues. You can also schedule a recording, although the syntax is not exactly user friendly (you just have to define the state or the time by changing the existing text entries. It’s not difficult once you understand them, though). You can also change the Source and few other settings by clicking on the ‘Additional settings’ button as well. There’s a big fat button at the top left corner for starting or stopping a recording, and the rest of the horizontal area towards the right side corner is used for displaying the elapsed time and the sound level. That’s pretty much it. You’re welcome Paul 🙂 .